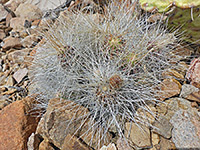 Like most echinocerei, the strawberry hedgehog cactus forms large, rounded clusters, with stems rather taller than other varieties (up to 12 inches), covered by longer and more densely spaced spines. There are 2 to 4 central spines (up to 3 inches long) and 7 to 14 shorter radials, all usually white to light brown in color. 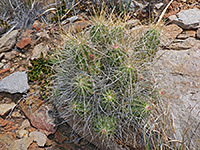 The cactus produces edible, strawberry-tasting fruits, up to 2 inches long, and is widespread in Mexico but has more limited distribution in the USA. Clumps may be 3 feet across and contain several hundred stems. 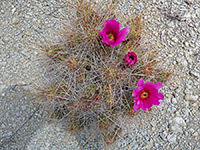 Similar species are echinocereus nicholii and echinocereus engelmannii, but the ranges are quite different.